One of the cool things about having a food blog is that everyone wants to go eat with you. Makes for a busy week but breaking bread with people is always fun. I usually try to make them guest blog but not everyone is up for that. 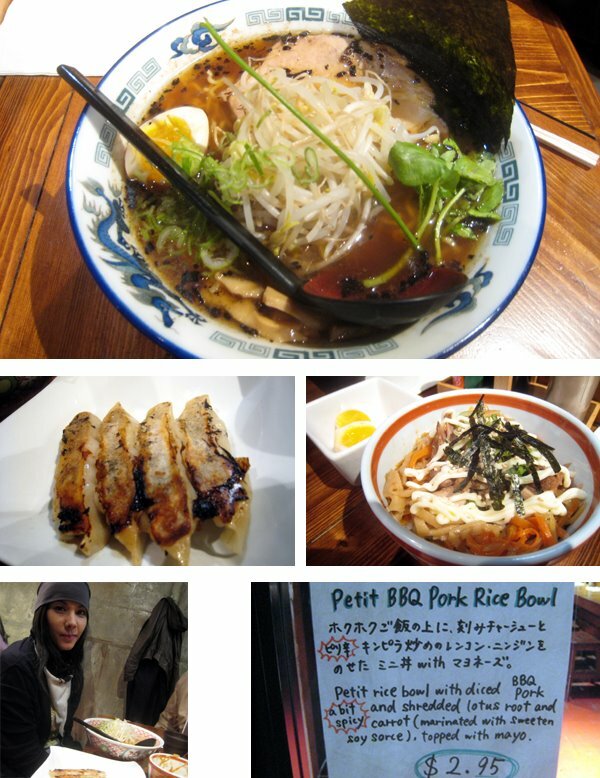 This trip my friend wanted ramen so we went to Motomachi Shokudo located in the West End. I have talked about the ramen at Motomachi Shokudo before, and I still feel that it is the best ramen place in town (just a hair above Kintaro - same ownership) but some will argue that Kintaro is still better. To each their own, but I would say the battle is close but the interior of Motomachi and the fact there are less lines gives it the edge. This time I want to talk about this three dollar Petit BBQ Pork Rice Bowl. It is small but tastes incredible, mildly spicy BBQ pork with shredded lotus root and carrot and marinated in sweetened soy sauce and topped with mayo. It was really tasty, it has some similarities to the teriyaki bowl with mayo at Zakushi. For three bucks, you need to go to Motomachi and try this thing. Hey Gyromite, I'm with you on giving MS the edge in the Vancouver ramen game over K. I wasn't aware of this Petit BBQ Pork Rice Bowl. Is it a special menu item that's only there for a while, or has it been there all along? I think it might be a special menu because it was written on a piece of paper but I know it has been available for a some time now. Is it big enough for a meal? The price and the 'petit' make me think no. I really like the brown rice sushi bite or whatever it's called that they have. Naw it is pretty small, it is intended to be a side. But for 3 bucks, it is a good amount of food.